We wrote a few weeks back about our experience at Keller Estate; which was one of the best combination of wine, ambiance, and view at a winery that we have encountered. We had decided that we wanted to go back and try their brunch experience and so we booked to attend the first such event of 2017. California Girl comments: We were so impressed during our last visit, that we named Keller Estate our favorite new winery of 2016. This place has it all; amazing wines, gorgeous scenery, art, architecture, cars, and wonderful staff. This weekend we got to add to the list a cool place to have a gourmet, wine-paired brunch. After the recent rain, we were blessed with a beautiful clear day which reinforced the estate’s beauty. We were greeted by our hosts from our first visit who introduced us to Ana Keller, daughter of the founder and Estate Director and offered us a glass of Mimosa (Known in the UK as Bucks Fizz). The Bucks Fizz used the 2003 vintage; the first year they had made Sparkling wine. It was 100% Chardonnay; with the 2010 and 2015 being 80% Pinot Noir and 20% Chardonnay. Using a fourteen-year-old wine to mix with orange juice seemed almost sacrilegious, but I am too polite a guest to decline the drink on those grounds. California Girl comments: I have to say that I thought the quality of the sparkling wine deserved far more than a simple mimosa. It was a DELICIOUS mimosa, but dang it just seems wrong to add orange juice to a sparkling wine that good. We were taken upstairs to a room that sits above the tasting room. 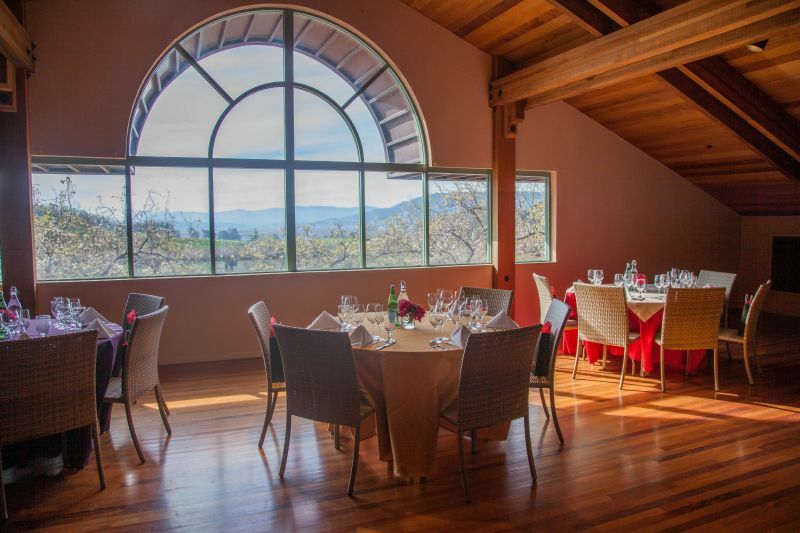 A large window provides a delightful view over the courtyard, the vineyards, and the hills on the far side of Sonoma Valley in the distance. Each place on the table had four glasses; one for water and then one for each of the wines with which the three-course of brunch would pair. Before each course was served, the relevant wine was poured into the appropriate glass. California Girl comments: The events space, like everywhere else at Keller Estates is classy. The views from the huge picture window over the vineyards and the Petaluma Gap floor were just stunning. I can only imagine what the brunch is like in the warmer weather when it is served on the patio outside. That would be a WOW! California Girl comments: Our chef for brunch was Sasha Kupelian. He’s a very talented guy. We were impressed with the originality of the dishes he served. I have to warn our readers; this brunch was a little more “gourmet” than many people would appreciate. At times the menu was challenging to the palate and I am unsure how it would go over with “plain eaters”. My mother, for example, would not have enjoyed the brunch. She is neither adventurous with her food, nor is she opened minded about trying new dishes and cooking methods. The first course was cauliflower with lemon garlic aioli. It was served with a radicchio, leaf lettuce, and pomegranate seed slaw. Radicchio is also known as Italian chicory, which is a lot easier to spell. I loved the rich hues that this dish offered; such a contrast to a regular salad dominated by shades of green. The Italian chicory offered a crunch and slight bitterness that worked well with the softer cauliflower and the acidic tinged creaminess of the aioli. This was paired with the 2013 Keller Estate 2013 Chardonnay; a wine that I had enjoyed on the previous trip, but was elevated by the presence of the salad. California Girl comments: The cauliflower salad was fresh and light. The cook on the cauliflower was a bit longer than blanched; still crunchy. The different colors of green purple and white florets on the plate were appealing with the pool of lemon garlic sauce. It was a unique combination and visually very appealing. 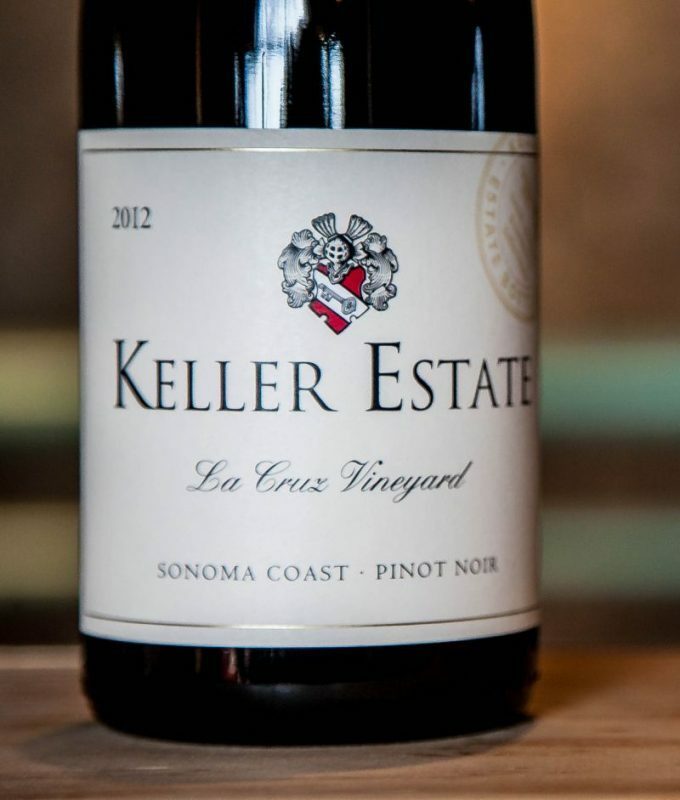 The next course was paired with the Keller Estate 2012 La Cruz Pinot Noir. The wine had rich cherry notes with a sprinkle of pepper. California Girl comments: During our last visit to Keller Estate, we had the opportunity to try this wine. The Brit could not remember off hand if it was the La Cruz that he preferred or the El Coro. I could tell immediately by the smell of the wine which had a smokey, wood smell amongst the dark berries that it was the La Cruz that was his pick. It is a beautiful wine, deep and complex. If you enjoy a pinot noir with hints of smoke and wood and raspberry, cherry, and cinnamon on the palate, this wine is for you. 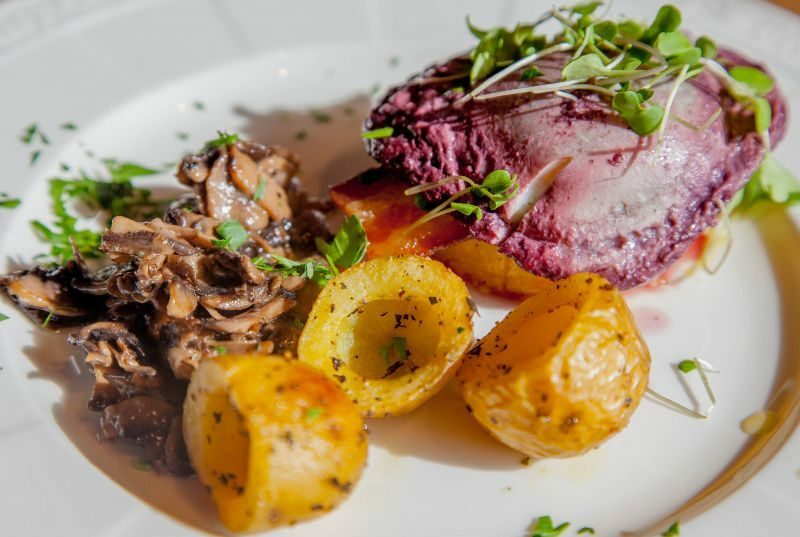 The dish was a red wine poached egg on a bed of polenta, with mushrooms, bacon, and small skin-on hollowed out potatoes. This plate again offered an unusual colour display; with the egg being a regal shade of purple. I do not eat eggs, so shall not comment on that part of the meal. The mushrooms were cooked to perfection, soft, but not mushy. I adored the potatoes; the texture contrast offered by being baked in the skin made them an ideal match for the crisp bacon and the fungi. I am not a fan of polenta. I have frequently compared it to wallpaper paste. Here, however, the herbs and spices gave it a lift and for the first time, I could see why people would eat polenta of their own free will. California Girl comments: There were things I liked about this dish and things of which I wasn’t so fond. First, I am not normally a polenta fan, but I thought the way this polenta cake was prepared got the absolute best out of it. There was a real flavor of herbs in it that lifted the polenta from just being bland cornmeal. The bacon was excellent in quality and crispiness without being dry. The cook on my poached egg was good, and the combination of the three was a great idea. (Especially if you are a lover of polenta). However, I felt that poaching the egg in the wine was too discordant in flavor with the rest of the dish. I would have preferred the egg being poached either plainly, or perhaps chardonnay if you were going to do it with wine. The potatoes and the mushrooms were both excellent, cooked perfectly and full of flavor. The best was saved for last. 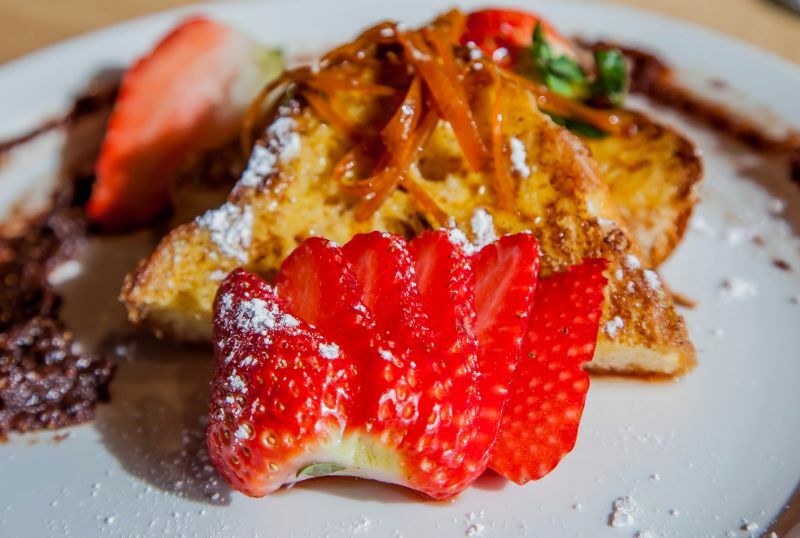 The final course was brioche French toast with a honey red wine gastrique, strawberries, and a fig compote. Or put another way, the traditional role of maple syrup was taken by a honey and red wine sauce and there was fig jam on the side. I am a traditionalist in many ways. I am open to many variations of French toast, but all of them involve the addition of maple syrup. In that light of that opinion, it speaks volume for the artistry of this dish that I loved this deviation from a fundamental requirement. The acidity from the red wine balanced the sweetness of the honey and, more importantly, ensured that the sparkling wine was a perfect pair for the dish. California Girl comments: This french toast was wonderful. I loved the honey and wine combination which made up the gastrique (syrup). It made it far less sweet, a bit richer, and with the sliced orange peel, the flavor was great. I liked the complement of fig compote with the dish. Somehow, I think our plates were missing a component, though. We did not have the almond infused Creme Fraiche served with our dishes. That addition would have made it perfection. At the end of the meal we were offered an opportunity to revisit any wine that we wished; an offer we declined. We did, however, purchase a couple of bottles of the 2010 sparkling wine. 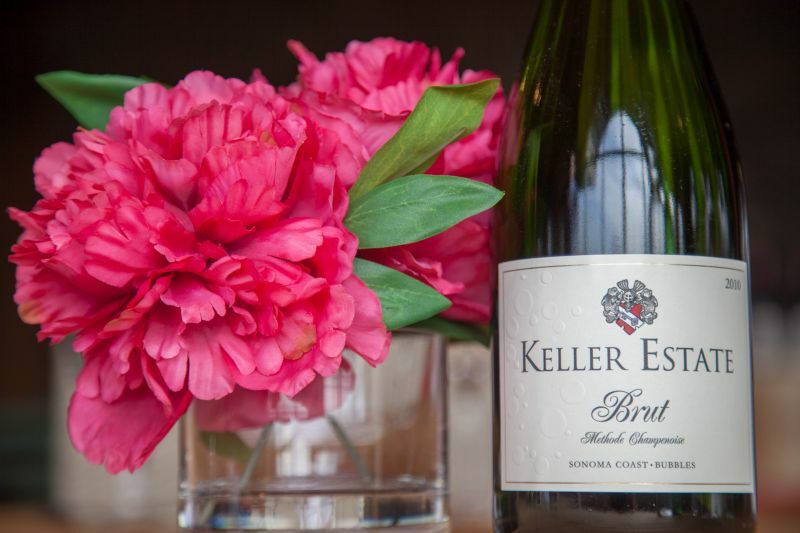 California Girl comments: We really enjoy Keller Estate sparkling wine. For the price ($35), it shows fantastic value and quality. I would highly recommend it! 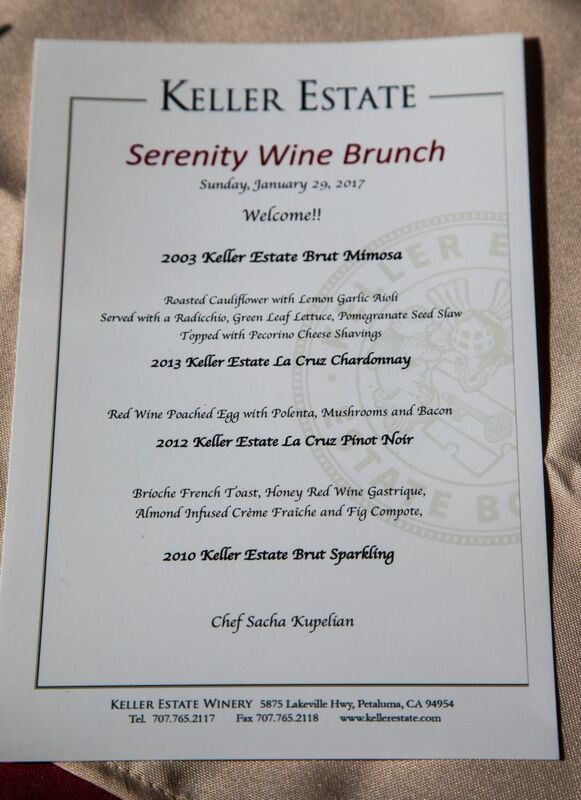 We thoroughly enjoyed the Keller Estate Serenity Wine Brunch. The staff are charming and informative. 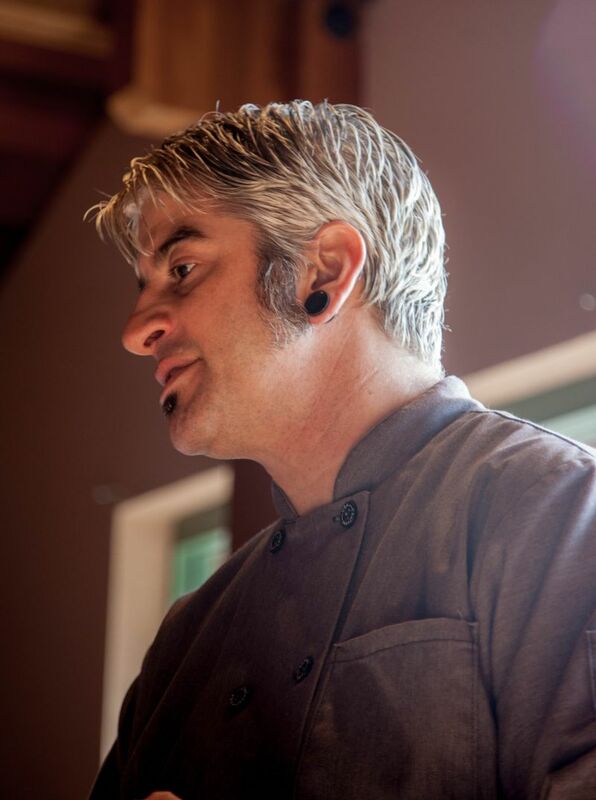 The chef, Sacha Kupelian, came at the start of each course to describe the food before us. Ana Keller in talking about her approach to winemaking provided an insight into the passion and care that makes such remarkable wines. 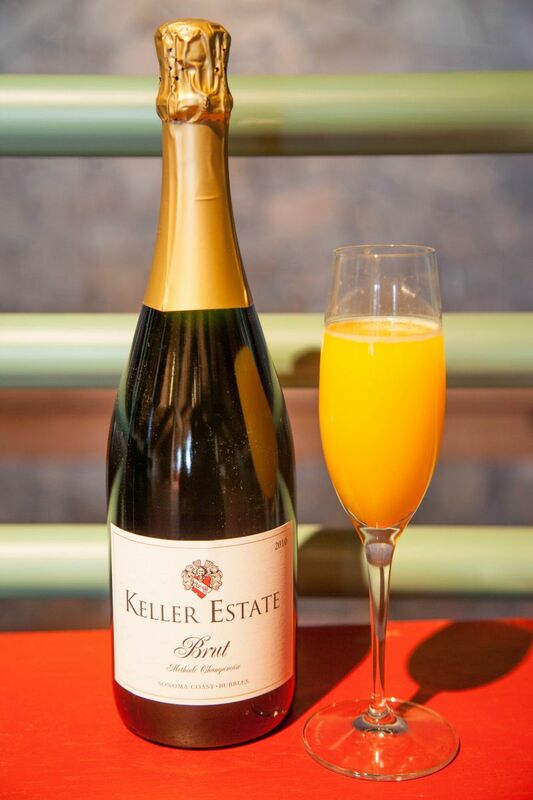 If you want a brunch that offers a choice from a familiar range of options, Keller Estates is not the brunch for you. 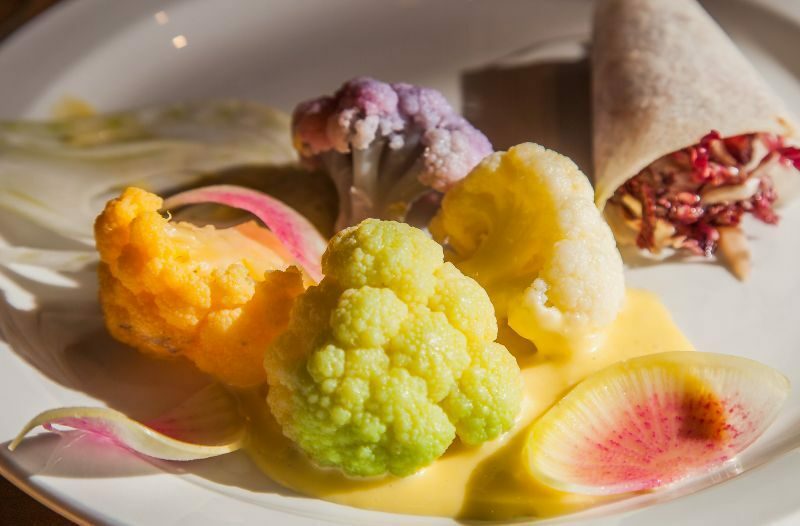 This is a brunch that offers unique, challenging dishes carefully crafted to pair with wine. For those of you who are interested in the Serenity Brunch, it is by reservation only and set 48 hours in advance. The cost per person is $65.00. Keller Estate also has a special Wine and Chocolate pairing coming up for Valentines weekend. This place is romantic, and one that would impress that special person in your life. Mi Sazon Mexican Grill, Fairfield, Ca.